While not everyone suffers from headaches and migraines, those who do actually writhe around in unspoken agony while the world mercilessly looks on. Popping a couple of paracetemol pills might be the most convenient thing to do, but there are some people out there who are seemingly immune to the effects of such medication, leading them to look for other forms of relief. How about the Headache Relieving Wrap? Developed by a neurologist, this head wrap helps relieve headaches naturally, eliminating the need for medications. A study published by the Archives of Family Medicine proved that the head wrap alleviated migraine and tension headaches in 87% of patients. The unit straps comfortably to your head and provides a soothing, consistent pressure that gently compresses blood vessels to help relieve migraines. 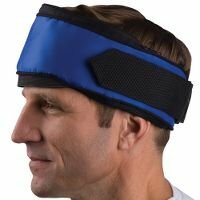 It comes with three reusable gel packs that can be heated or frozen, and inserted into the headband to provide relief from throbbing pain. Heat therapy relaxes tense muscles and the cold treatment cools and constricts blood vessels, helping to alleviate tension headaches. The headband is insulated to retain heat and cold and its adjustable strap and Velcro strap keep it in place. One size fits all. While it might make you look as though you were wearing a turban, missing a flute and a cobra to play the part of the snake charmer, forking out $49.95 as a last resort might actually work in your favor.